Everyone is different. It's o.k. for us to be different. It doesn't make one right, or one wrong. I am fairly spontaneous in life and school. However, I need the house to be organized in order to enjoy spontaneity. This could be because our life has routinely been insanely busy and if the home isn't in shape - it makes us all cranky. We had seasons like that - and I refuse to go back there. When family members voice they need a clean room to be at peace, I listen. It's something I CAN provide. Organization is key when one moves frequently. The peanut butter is ALWAYS above the toaster, the bread basket is always beside the toaster, the silverware is always nearest the table, the whatnot is always in the nightstand drawer, etc - regardless of the house. Because our family is wired this way, I strive to be "moved in" within one to two weeks. I've had lots of practice and we are usually done, except photos hung, after the first week. I try to accommodate those who need order and structure and those who enjoy chaos. I tend to think of it is organized chaos. This balance is hardest to maintain during a move - and I'm glad to be entering a season in life which may not include moves every 2-3 years. Ask me in a few years - growing up an MK, marrying a pastor who went into the military, frankly I don't know what it's LIKE to be in one place for many years. As Michael struggled to do major projects in a garage yet to be organized, I realized I feel the same frustration about schooling, my big project, in a house which is foundationally disarrayed. We create a special kind of chaos while we school. We have stretched out the move-in process: as we painted, hosted friends and family, worried about Jared, helped the older Gherkins to feel settled, and have a myriad of outside projects to complete before winter. We've been in the house a month. Photos on the walls make the house feel finished. As my young friend, Allie, said, "This house is nice. It will be really pretty when you get the pictures on the wall." She was sitting by the tower of living room photos at the🐽 time. I have previously been asked not to hang photos. I tend to be fairly haphazard about it, in the eyes of some, though it makes sense in my mind. Michael has a process - and it looks great when he is done. It takes time. 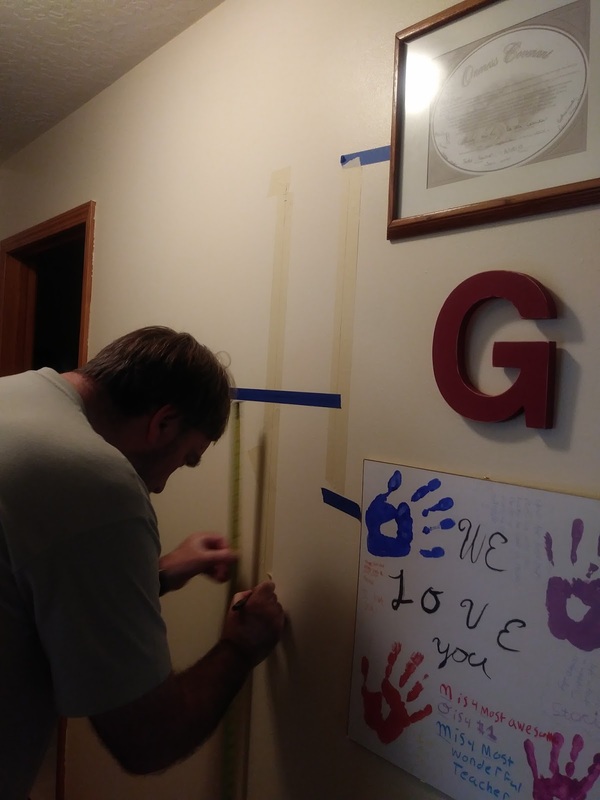 He takes hangers off the backs and puts new ones that work better at each location, he tapes the wall, marks the center on the photo, changes some frames so the same color is on one wall.....he's good at this. Michael and Jamin spent a good part of a day hanging photos. 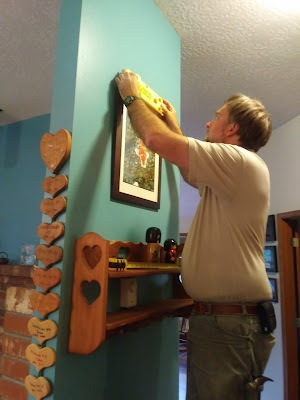 He spent another couple afternoons/evenings hanging photos. The job is harder as we go from 15 foot walls to rooms with WINDOWS and very little photo space. I've decided which ones will be stored, some have gone to the thrift store, some may be re-gifted. Arielle and I figured out where we'd put the photos and took photos of the arrangements. We did not put a nail in the wall. Michael spent all of today working on photos. The photos are done in the hallway. They are done in the living room. They are done in the master bedroom. Shelves are up in the entry way. He needs to move on to other projects. Therefore, I hung photos up in the game room and laundry room. I will finish the bathrooms and kids' rooms. I also rearranged some photos in the nook to add a photo he took from another setting. He has promised not to get upset when they aren't perfectly level or spaced. I have promised not to bug him about the couple of things we are finding that still need to go up. There will be winter days for finishing. Arielle is working on arranging all our family on this bigger, Super Scrabble board. The original one, Krista made us, will stay in Uchi. 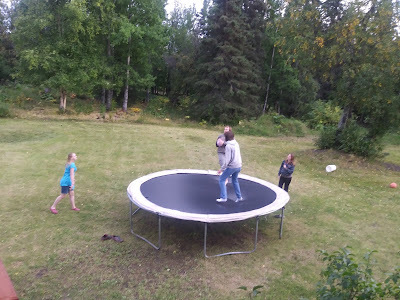 The kids found it expedient to get out of the house at some point.....they moved the trampoline back and enjoyed some trampoline dodge ball.